Belle Baby Carriers offers twelve stylish patterns, including five organic baby carriers made of hemp / organic cotton fabrics. 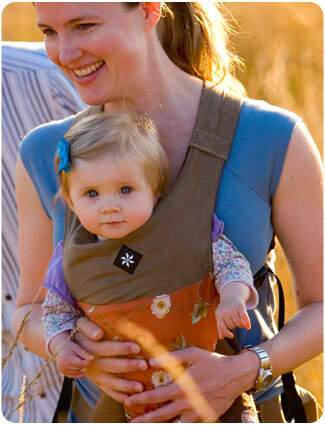 Unlike most other baby carriers and slings, the Belle allows direct contact between you and your baby. The baby is nestled directly against the parent without straps or fabric in between, allowing increased bonding and discreet nursing. More comfortable than a baby sling, the Belle Baby Carrier distributes your baby's weight to your hips, instead of your back and shoulders, and places your baby in a proper, ergonomic position that supports your baby's developing spine. With no extra bulk, Belle Baby Carriers are lightweight, cool in the summer, and easy to stow away. These baby carriers allow your baby to face toward you or away and are easy to use without any assistance. Every Belle Baby Carrier also comes with a lightweight detachable head support panel for additional head support if needed. The Belle Baby Carrier is ideal for infants 8-30 lbs. Upon first glance I was impressed with the style of the Belle Baby Carrier, with range of colors/patterns, there is something to suit every ones style. I received the Belle Baby Carrier in the beautiful Orange Blossom pattern(pictured above) for review. I was excited to see how Belle's unique design distributes the weight of baby to the hips rather than the back and shoulders..... as it seemed it would make it not only easier but comfortable to "baby wear". Although my little one's are now too old for baby wearing, I did try it out with the princess (she weights the maximum recommended weight of 30 lbs.). I could definitely feel the difference in weight distribution. The design of the Belle carrier allows for the baby to remain as close as possible to mom/dad/caregiver mimicking the comfort and security of the womb. Adding to the great design is the included infant head support (included with every Belle Baby Carrier) other brands generally don't include the head support - they must be purchased separately). With so many benefits, the Belle Baby carrier is a great investment in quality time with your precious little one. Super stylish, ORGANIC, soft and comfortable! Belle not only makes baby wearing possible, they make it a joyous experience all around! Experience the Belle Baby Carrier! One Lucky Reader will receive a Belle Baby Carrier! Winner will have the opportunity to choose the style/design that they receive as well! Leave a comment~Visit Belle Baby Carriers at http://www.bellebabycarriers.com/ and let me know which style/design you would love to have for your little one. The comment is considered your entry. Entry to this giveaway ends at 12pm PST November 12, 2010. Winner's are chosen randomly through random.org. The winner will be announced in a post within 7 days of the giveaway ending, and contacted through email. The winner will have 48 hrs. to respond or another winner will be chosen. I would love to have the Organic Black baby carrier! I love the organic moss carrier! I'd definitely pick the cappucchino but they are all cute! I would love the Organic Moss carrier, thanks! I would love to try the Orange Blossom carrier. Now following you on Twitter as YellowTennessee. Entry 2. I follow Belle Baby Carriers on Twitter. Entry 1. I follow Belle Baby Carriers on Twitter. Entry 2. I follow Belle Baby Carriers on Twitter. Entry 3. I follow Belle Baby Carriers on Twitter. Entry 4. I follow Belle Baby Carriers on Twitter. Entry 5. I like Belle Baby Carriers on Facebook( Rachel Cadaret-Akers). Entry 1. I like Belle Baby Carriers on Facebook( Rachel Cadaret-Akers). Entry 2. I like Belle Baby Carriers on Facebook( Rachel Cadaret-Akers). Entry 3. I like Belle Baby Carriers on Facebook( Rachel Cadaret-Akers). Entry 4. I like Belle Baby Carriers on Facebook( Rachel Cadaret-Akers). Entry 5. I would choose the Organic Moss color! I'm a follower. I would love to have the cherry deco carrier.